Under a PPA, the energy consumer pays for electricity consumed or generated from a solar PV system installed on their premises. The benefit to the consumer is that there is no upfront cost. There is a range of legal considerations for a business looking to offer a PPA. Are solar panels fixtures? What can go wrong? Today we answer some of these key questions. PPA stands for Power Purchase Agreement. It is a contract to purchase electricity at a pre-determined price for a fixed period. Who are the parties to a PPA? • A purchaser or off-taker. • A utility or authorised energy retailer. • A vendor or power producer, developer, Independent Power Producer or investor. Key Distinctions of a PPA? There are many types of PPA but the key distinctions are: The location of the generator and whether a third party is required. • In the National Energy Market (NEM) electricity prices are set by the Australian Energy Market Operator (AEMO). • The transport of electricity from generators to consumers is facilitated through a ‘pool’, or spot market, where the output from all generators is aggregated and scheduled at five-minute intervals to meet demand. • A dispatch price is determined every five minutes, and six dispatch prices are averaged every half-hour to determine the ‘spot price’ for each NEM region. • The spot price is used as the basis for setting the financial transactions for all electricity traded on the NEM. The NEM is a wholesale electricity market in which generators sell electricity and retailers buy it to on-sell to consumers. There are over 100 generators and retailers participating in the market, so it’s highly competitive electricity prices in the wholesale market. All electricity sales are traded through the NEM. It is a wholesale market and prices fluctuate in response to supply and demand at any point in time. • Offers by generators to supply electricity to the market at particular volumes and prices at set times. • Demand at any given time. To manage price volatility, retailers and generators often enter into hedging contracts to fix the price for future electricity sales. • These are usually used by businesses that have a heavy load such as a data centre. • The energy is physically supplied and sold directly to the purchaser and the purchaser retains the rights to the renewable energy certificate. • This agreement is used to provide solar energy to consumers. • The customer does not have to bear the cost of installing the solar system. • The vendor sells the customer energy at a fixed rate which is often lower than the market rate. • The vendor will receive renewable energy certificates which accrue from the solar system. • During the term of the PPA, the vendor is responsible for the maintenance of the solar system. • At the end of the term, the customer has the option to end the relationship and request the vendor to remove the solar system, seek to extend the PPA or purchase the solar system outright. 2. Generator sells any excess electricity into the grid, either at a merchant or through a PPA with a retailer. 3. The consumer continues to purchase electricity from the retailer under a standard ESA to cover load requirements where the generator is not producing (i.e. ‘firming’) (note: may not be necessary for combined generations and storage solutions such as solar or wind + battery or solar or wind + diesel generation). 1. 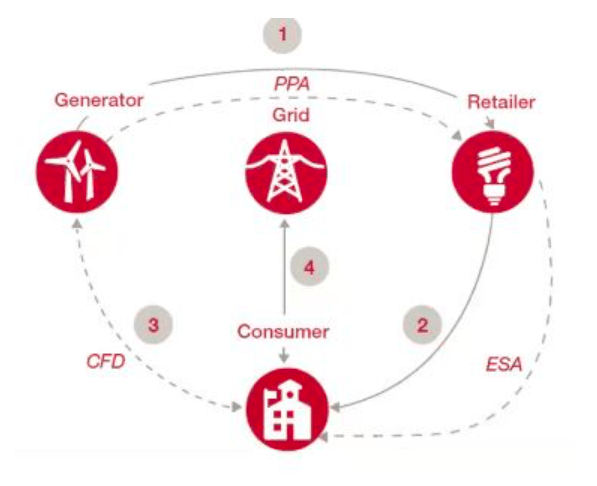 Generator sells power to the retailer under a PPA with a variable market price. 2. The retailer continues to sell power to the consumer under an electricity supply agreement (ESA). 3. Generator and consumer enter into a contract for difference (CFD) whereby they agree a fixed ‘strike’ price for the electricity produced by the generator. 4. The CFD is settled between the fixed strike price and the variable market price at which the generator sells the electricity it produces to the energy retailer. • This relates to a contract for the purchase of energy. • The purchaser is responsible for transferring the energy from the delivery point to its load. • A market participant is required. 3. The generator will transfer the electricity to the utility, which will sleeve it through the grid to buyer consumption sites. • This can also be referred to as a financial PPA as it is a form of hedging against increased energy prices. • Unlike a physical PPA, the energy is not physically supplied and sold directly from the energy generator/vendor to the purchaser. Instead the generator must connect to the National Energy Market, where the purchaser is supplied energy through a contract with an authorised market retailer. • A separate agreement such as a ‘contract-for-differences’ is agreed between the generator/vendor and the purchaser to guard against fluctuations in the spot price for electricity which will be reflected in the retail contract. This means that, in effect, the energy and relevant renewable energy certificates are provided to the purchaser at a ‘fixed price’. • The most common example of this PPA is a Corporate PPA. • Corporate PPAs can be structured in a variety of ways depending on the needs of the purchaser. 4. 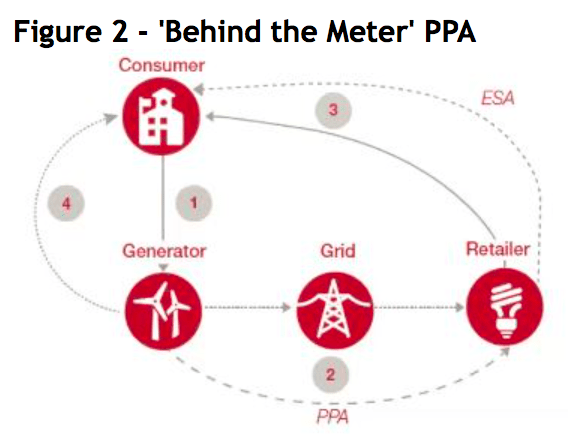 The buyer continues to buy its power from the utility at the variable market price, which is now hedged by the synthetic PPA. 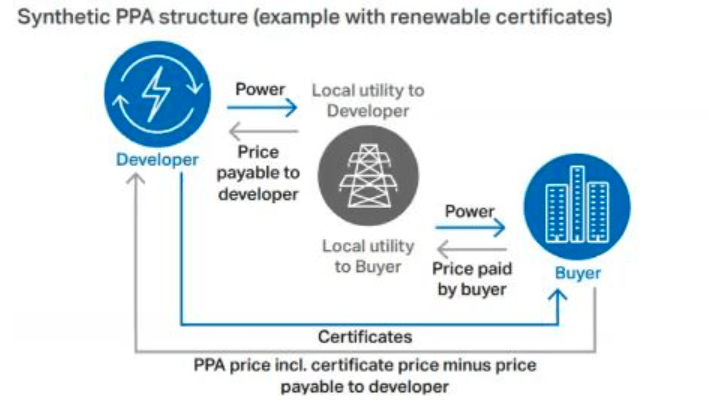 • Due to the increase in power prices in Australia over recent years, there has been an upsurge of interest in Corporate PPAs. • Corporate PPAs have long been used in the USA and Europe to reduce the cost of energy for companies. • A Corporate PPA allows a company/corporation to set the price of electricity at a fixed rate rather than be subject to the spot price. • During the operation of a solar PPA the solar system, including the solar panels, remain the property of the vendor. • The system however will usually be physically installed at the customers residence. • If the relationship fails then how does the vendor recover its system? • One way to protect the assets is to register a security interest on the Personal Property Securities Register (PPSR). • The Personal Property Securities Act 2009 (Cth) (PPSA) applies to personal property in Australia. It does not apply to land. • Solar panels do not come within the definition of serial numbered goods. • Counterparty risk- with regard to the length of the agreement, and capacity to deliver. • Simple PPAs?- transfer of ownership, generated quantity vs consumed quantity, a right to sunlight, PPSR.